Clara: Let’s talk a bit more about anti-Semitism. The same people who warned me off have accused you of being an anti-Semite. They quote you as writing: ‘Actually I carefully carve out the contempt for the Jew in me’. Now I understand that an anti-Semite is a person who discriminates against Jews as a race. So are you a racist who hates his own race instead of a different one? Gilad: I believe that Jewish race is an empty signifier. In ‘The Wandering Who’ I deal with those who identify politically as Jews. I do not deal with ‘the Jews’, I do not touch issues to do with race. I do not engage with Judaism (the Jewish religion) either. But here is a question you and me and everyone else should ask ourselves: How is it possible that me hating the Jew in me concerns so many Jews who have nothing to do with me? Is it possible that my so called ‘self hatred’ is a concern for other Jews because it reveals a deep problem at the heart of Jewish Identity most self identified Jews work hard to conceal? I know many gay self haters, they are not subject to pressure by their identitarian community. Self hating Brits are getting the pass ticket. Even self hating Catholics get away with their ‘crime.’ But Jewish self hatred seems as a vile crime. We should ask why? Why was Jesus nailed to the cross? Why were Spinoza and Uriel Da Costa subject to vile Herem? The answer is probably in the Old Testament. The prophets were probably the Athenians amongst the Jerusalemites. Clara: I could say about myself that ‘I carefully carve out my contempt for the Protestant in me’, the meanness, the exaggerated work ethos, the inability to relax and just have fun once in a while … Nobody would call that racist, these are deeply-embedded cultural features, some of them I embrace, some of them I try to overcome. Gilad: This is indeed a good place to start. Why you can hate the protestant in you, yet I can’t despise the Jew in me. It is hard to deny the fact that, despite Jews not being a race, Jewish politics is always racially driven. This obviously applies to Israel, the Jewish State, and its discrimination of Palestinians (look at Israel’s Law of Return), black and Goyim in general, but it also applies to the Jewish anti Zionists such as JVP. You, Clara, can subscribe to JVP (Jewish Voice of Peace), you can donate money but you will never become their secretary. Why? Because you are not racially qualified. I guess that me pointing at this makes me into a public enemy. Clara: How do I ‘qualify’ as a Jew according to the JVP rules? Must I be born one or is converting to Judaism enough? Gilad: You don’t, but I guess that conversion to Judaism is an option. I am critical of all forms of racism and biologically oriented politics, and this includes Jewish racism as well as Nazism! Nazis prosecuted Jews for being Jews. Jews were subject to persecution for what they were rather than what they did. Such a transition is indeed the death of innocence. But in the Jewish State Palestinians are discriminated for not being Jews. I do insist to put reason into play until such an exercise is officially banned. Clara: So you see no basic difference between the way Palestinians are treated by Jews in Israel and the way the Jews were treated in Nazi Germany? But weren’t that perfectly rational pseudo-scientific definition of race and the skilful bureaucratic and ‘industrialized’ organization of genocide racism brought to heights beyond any human imagination? And wasn’t thus the Holocaust the unique event of genocide in history? Gilad: This is a good question that should be discussed openly and not with a gun to your head. But let’s extend this question; was the Holocaust more unique than the Holodomor? 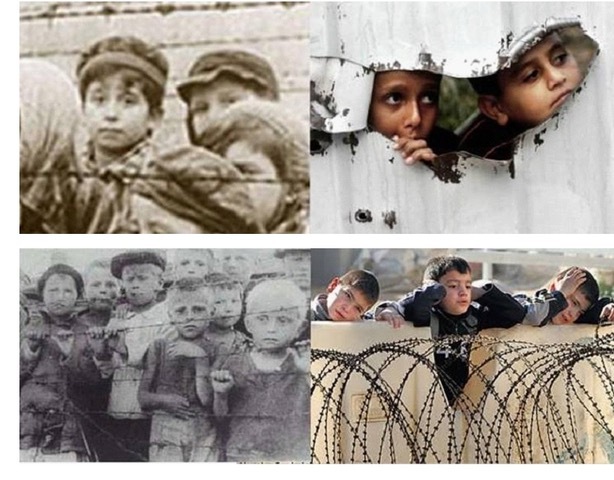 Is two years in Auschwitz more unique than 70 years in Gaza? I don’t know the answers to these questions, and I do not think that we need to answer these questions. As I show in my book ‘Being in time’ this is the all point of being Athenian as opposed to being a Jerusalemite. Athenians are dedicated to the primacy of questioning. The Jerusalemites impose answers by means of commandments and Mitzvoth (Political Correctness). I believe that these questions must be open and subject to constant examination and revision. Clara: That makes a lot of sense. There are a lot of questions to be raised. For one it is well known that racist theories were not a unique Nazi thing. There was a strong Anglo-Saxon scientific movement promoting the killing or at least sterilisation of the ‘unfit’ and it is very probable that Hitler read a lot of that kind of literature while writing ‘Mein Kampf’ in prison. And some people also would surely like to know why the Allies didn’t do more to prevent the Jewish genocide. They quite certainly were informed about what was going on. And they could have bombed the railways. Gilad: Exactly. If you really want to talk about Hitler and Nazism, I’ll be frank with you. Race and racism weren’t invented by Hitler or the Nazi Party. As I mentioned before, Zionism that promised to ‘make the Jews great again’ was born 30 years before Hitler’s ‘Mein Kampf’ and Jewish exceptionalism being racially driven was born 3000 years before Zionism. I am the last person to advocate biologically driven politics. In fact I criticize New Left Identiterianism for being Hitlerian. I am equally critical of White identitarians. But when you read ‘The Destruction of Dresden’ by David Irving you grasp the extent of the genocidal intent in the minds of Anglo-American’s policy makers. I want to live in a world where ideas can be exchanged freely and ethical thinking is explored with no limit. In fact, we are having this discussion now because those elementary liberties are fading rapidly in front of our eyes. This entire Holocaust phobia has proven to pave the path to a new banality of evil that is as blind as the old one.